As National Cancer Prevention Month draws to a close, I thought this would be a really relevant topic to help raise awareness for moms and moms-to-be about the cancer risks found in common body care products. 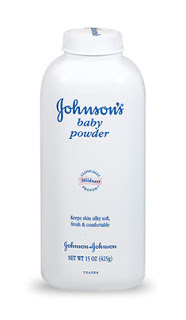 I am really concerned that this popular brand of baby powder, promoted by many OB health professionals and advertised as a household staple for moms, is still formulated with two potentially harmful ingredients, talc and fragrance! The information below about the risks of talc comes from The Cancer Prevention Coalition website. You can read more about the risks of synthetic fragrances in my Healthy Moms article Is Your Favorite Fragrance Making You Sick? Be aware that talc is also an ingredient in many cosmetics and body powders. Check out the easy recipe at the bottom of this post to make your own safe and economical baby or body powder using pure cornstarch and therapeutic essential oils. Place cornstarch in a large glass jar and add the essential oil drop by drop. Tightly close the jar and shake it to distribute the oil, breaking up any clumps. Let stand 4 days to distribute the essential oil. Use with every diaper change, or as needed. Potato starch or arrowroot powder can be used instead of cornstarch. Spice or salt shakers with large holes in their lids make good baby powder containers. Subscribe to my free e-newsletter or visit Oils For Wellness to learn more about healthy alternatives to chemical products and discover everyday uses for essential oils! oh my! I never knew that talc is harmful. I definitely knew about baby powder being harmful, but mainly from working as a nurse. I had no idea that it was used in so many other products though! Oh wow, I had NO idea!!!! Thank you for sharing this information! Thanks for your comments, so glad you found the article enlightening and helpful! This article is absolutely ridiculous. I'm a research geologist and there is no factual basis for this article. If you look up the results from the studies cited these claims are completely unwarranted. The studies themselves state that there is little to no correlation between the incidence of cancer and the use of talc products. There is no more danger in using talc products as there is in drinking tap water.